Last January I made a plan to be more productive, a celebration and cultivation of my skills. Many of the goals slipped away as time passed and production stopped altogether for a few months while I sorted through some life changes and worked out of state for a month, but as life does, it all worked out. 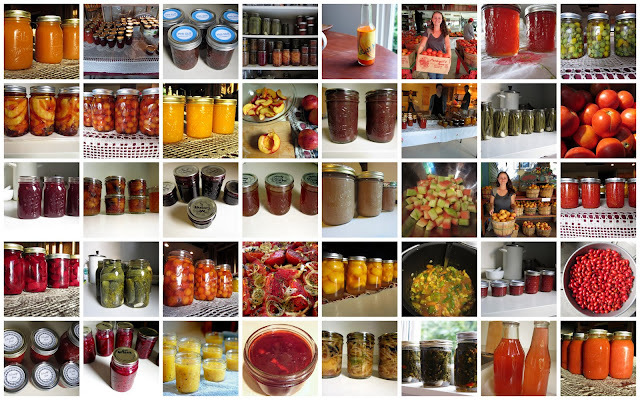 I dreamed a lofty goal of canning 12 batches of something or other... and with help from lovers, friends and family I put up 28 different varieties of preserves. To round it out to an even thirty I've included two batches where I only assisted with some of the preparation and not actual preservation. It's a technicality, really. I made a serious sacrifice by eating 10 pounds of watermelon in three days just so my boyfriend could make his grandma's watermelon rind pickles. I swear, there is no history of watermelon obsession in my lineage and I didn't enjoy a second of it. Promise! So here it is in mostly chronological order. Watermelon Pickles - I didn't make the pickles, but I ate all the delicious fruit inside! Quince Jelly - admittedly, I only helped pick the fruit, not process. And by pick, I mean hold a bag while someone else climbs a ladder and does all the real work. 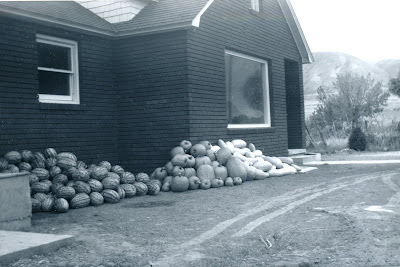 Great-Grandma Lena's fall harvest. Unknown year. Sorry, that was my deleted comment. I didn't realize I was logged into husband's account. I just wanted I enjoy reading your accomplishments, endeavors, and preservations skills. I wish I lived by you, so you could teach me a thing or two.